"In Allahabad HC, out of a sanctioned strength of 165 there are only 77 judges. In Karnataka High Court, an entire floor of courts is locked because there are no judges. Once we had a situation where we had judges but no court rooms. But now there are courtrooms but no judges. You may now as well close court rooms down and lock justice out. You can have the institution called the judiciary locked”. "The MoP is your red herring. The Law Minister and the government have repeatedly told us that the process of finalisation of MoP will not stall judicial appointments process. Now are you saying that there is a deadlock on the MoP and you want it cleared first before appointing judges?" Our tolerant approach seems to be not working. If you go on like this, we will re-convene a five-judge bench and say that the government will not be allowed to scuttle judicial appointments till it frames a new MoP... do you want that? Over all we had made 88 recommendations. you are sitting on them..If there are inconsistencies with them bring it back. If there are problems with the candidates tell us..do not bring the judiciary to a grinding halt”. Accusing the Centre of attempting of trying to bring the judiciary to a “grinding halt” and not bothering about courtrooms locked up due to absence of judges, the Supreme Court today once again slammed the Centre for delaying appointment of judges and almost summoned the Secretaries in the Prime Minister’s Office and Ministry of Justice. But Attorney General Mukul Rohatgi sought one more chance to “come up with something positive” by November 11, the next date of hearing defusing the volatile situation and preventing the summoning of the top officials. "In Allahabad, out of a sanctioned strength of 165 there are only 77 judges. In Karnataka High Court, an entire floor of courts are locked because there are no judges. Once we had a situation where we had judges but no court rooms. But now there are courtrooms but no judges. You may now as well close court rooms down and lock justice out. 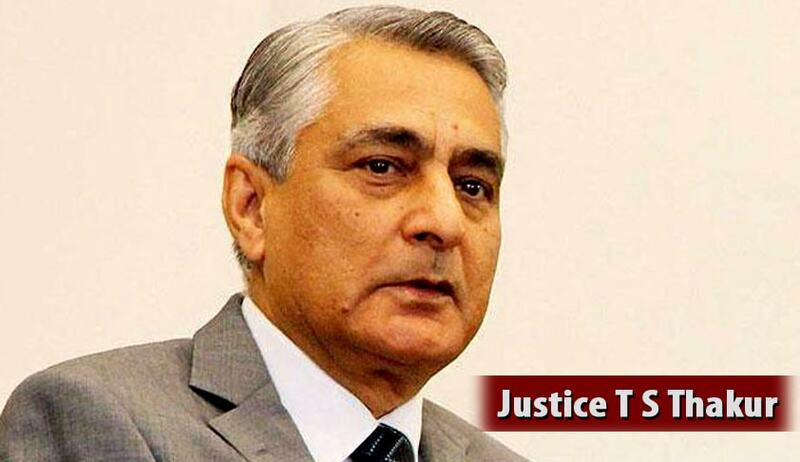 You can have the institution called the judiciary locked”, an angry Chief Justice T S Thakur told Attorney General Mukul Rohatgi who represented the centre while hearing a PIL filed by 1971 war veteran Lieutenant Colonel Anil Kabotra and BJP Leader Advocate Ashwini Upadhyaya on the issue. The scathing remarks began when Rohatgi began reading out the status report on judicial appointments and started off by saying that it had cleared two out of eight recommendations. The CJI said “what about the remaining six..it has been four months..over all we had made 88 recommendations..you are sitting on them..If there are inconsistencies with them bring it back. If there are problems with the candidates tell us..do not bring the judiciary to a grinding halt”. The CJI went on: “We feel we should ask the five-judge bench to say that there can be no delay in appointments and it shall be done using the present MOP. Government’s initiatives to bring in more investment from abroad including ‘Make In India, ‘Skill India’ will bear fruit only if there was a more effective judiciary in the country, Chief Justice T S Thakur had said at an international arbitration conference last Sunday hinting that there was an urgent need to fill the judicial vacancies. “In this country, 18,000 judges are handling 50 million cases. The avalanche of cases is putting the judicial system to tremendous stress. A major concern any foreign investor has regarding safety of his investment is the efficacy of the judicial system of the country where he is going to invest. It is intensively and deeply connected with our ambition of attracting more and more investment from other countries. Arbitration is good. But real trouble starts after the award. If the aggrieved in the arbitration challenges it , the case remains pending in a court for decades. Then what is the point? It is not the first time that CJI Thakur lashed out at the government on the issue. On August 12 he had said"The collegium has cleared 75 names of high court judges (for transfer/ appointment) but they have not been approved. I don't know why, where these files are stuck,"
"Why there is mistrust? Judges who have been transferred by the collegium have not been transferred. We don't want all this," the bench said. Not satisfied by Rohatgi’s repeated assurances, CJI Thakur said "Don't force us to ask where the files are... don't force us to judicially intervene... don't try to bring this institution to a grinding halt... That's not the right thing to do." It is to be noted that on April 25, 2016, during the national conference of state chief justices and chief ministers , an emotional CJI Thakur went on to launch an unprecedented attack on the present and earlier governments for often blaming the judiciary for mounting backlog of cases, which touched an alarming 3.14 crore, but at the same time doing nothing to improve the number of judges and increasing the number of courts despite repeated pleas from the judiciary. Read the Supplementary Affidavit filed by Petitioner Ashwani Upadhayay Here.